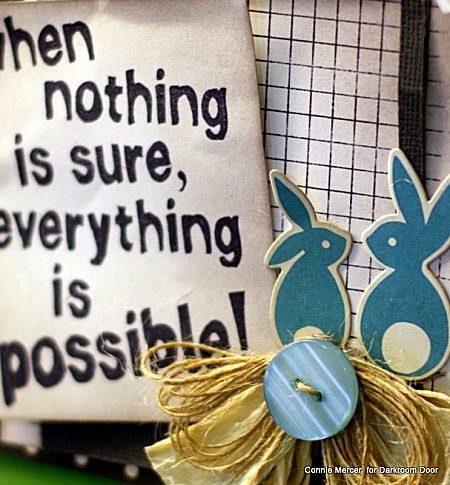 Hi guys, Connie here with a card using the "Possible" Quote stamp and the "Grid" Background stamp. I've used Archival Inks and the Instant Photo Frame by Sizzix. I only stamped half of the Grid Background stamp on the white cardstock. Then I layered the Instant Photo Frame over the grid. 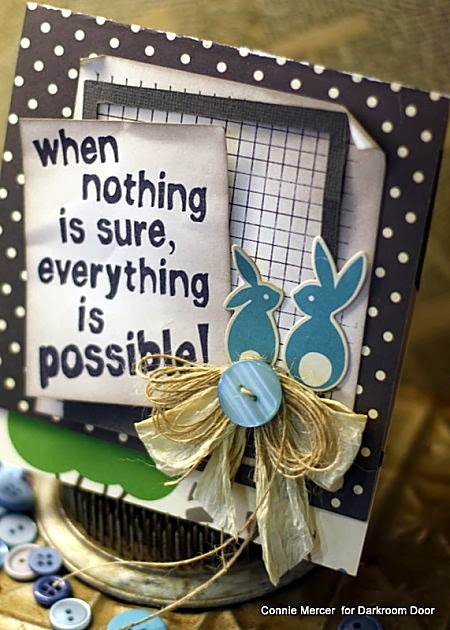 The quote was next and then I continued with embellishments to complete the card. Hello stampers! Thank you for your kind comments on our last post to welcome in our new Creative Team! A big congrats to Kim Ross - just for leaving a comment you have won a stamp set of your choice! Please email your mailing details and choice of stamp to info@darkroomdoor.com and we'll send out your prize! Hi everyone... Suzz here! The new Welcome Home set had me thinking about traveling and our family road trips. My family took a road trip to New York (which was fantastic), at the end of our trip it felt good to come home to our own beds. This card is inspired by that trip to New York. I inked up a piece of white cardstock using blue glimmer mist leftover on a craft mat. After the background had dried I sponged orange dye ink over a honeycomb stencil. I then stamped the Gazette Background using blue ink over the background. I stamped images from the New York Volume 1 and New York Volume II using black ink. 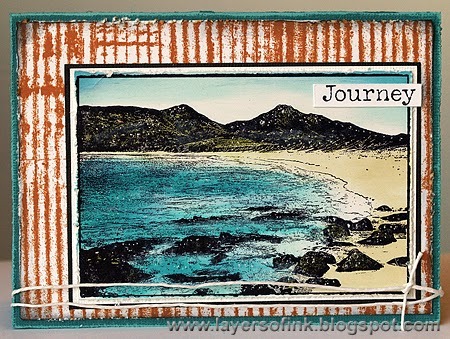 I intermixed the images with stamps from Vintage Office Set. Hi!! 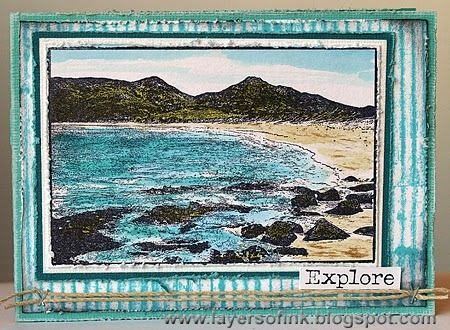 Belinda here today sharing my project using the fabulous new Country Windmill Photo Stamp. I have lots of photos of my own real windmill so I couldn't wait to use this stamp as an embellishment on a layout. I can just see myself using this stamp on some masculine cards too in the not so distant future. To create my windmill embellishments, I simply applied the Country Windmill Photo Stamp onto acetate using Ranger Archival Ink in Jet Black. I cut them out and then added to my layout using double-sided tape strategically positioned behind the black parts of the image so that it is hidden. I created this layout by building up layers on the background paper. First up, I heat embossed the Scratches Background Stamp using white embossing powder. I rubbed in Rusty Hinge Distress Ink and sprayed and splattered on some Pumpkin Pie Glimmermist. Next I used applied some Heidi Swapp Color Shine in Tinsel over a small template and flicked some splatters over the layout too. Then it was time for a stamping layer. 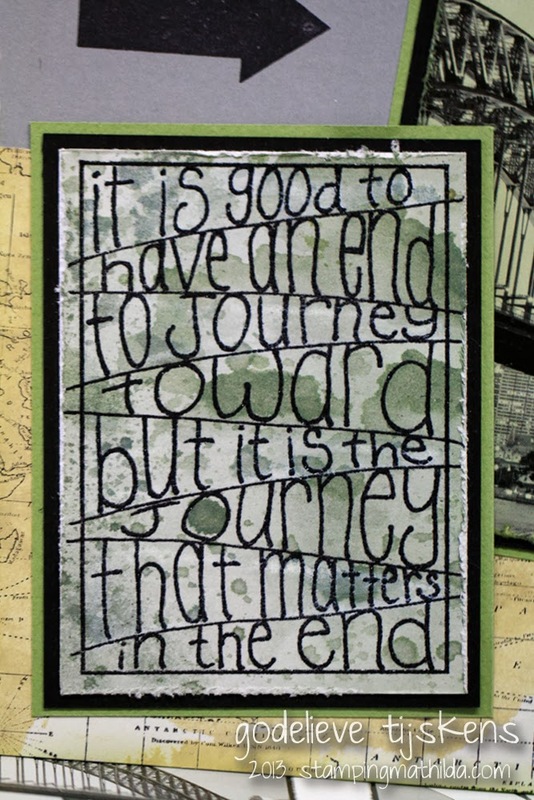 I used some quotes from the Essentials 11 Collection Everyday Life Rubber Stamps Set and applied repeatedly over the layout using Ranger Archival Inks in Coffee and Sienna. Finally it was a matter of layering on all of the embellishments, the photo and the title. 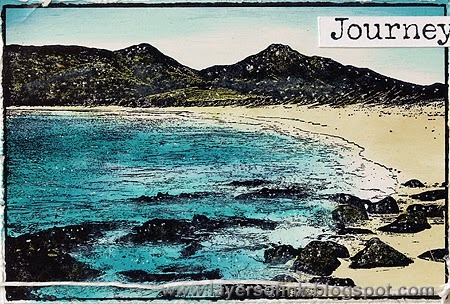 The stamp is a beautifully detailed landscape image that looks fantastic with a just little dash of colour. I coloured the image with Distress Markers and a waterbrush for a watercolour look. Once it was dry, I gave it a little spray with Goosebumps texture spray - it looks like it has been splashed with water. Hi! It's Hels here...I keep on saying it... I do! You know I am on the Darkroom Door Design Team for 2013? Well, it is THE best DT... I got a selection of the latest release stamps and I have been having a right old ball playing with them! Today's offering is an altered frame which I have used the new Beauty Quote stamp and a new Eclectic Butterfly stamp (he is ginormous and GORGEOUS!) To see the new releases and all the other delish stamps click HERE for the Darkroom Door website. This old frame started life as a greeny coloured plastic moulded jobby. And, as ever, I forgot to get a pic before I altered it! Whoops! I removed the glass and then cut a piece of patterned paper (the new Finnabair papers from Prima) to fit inside the frame. Layering stencils and Distress Inks over the paper to add a little specialness was a starting point. I didn't want the background too fussy so this is an ideal way of bringing in a bit of design without overpowering stuff. I added some Crackle background around the edges using Watering Can Archival Ink, stamping just using my hand to hold the stamp so I didn't overdo it and stamp too much into the centre of the paper. I stamped the Quote onto more of the paper and edged it with Aged Mahogany and Gathered Twigs DI's and then popped it onto black card to make it pop more. The Butterfly is the big guy in the centre... he was stamped onto cream card, along with more butterflies from the Wings Stamp Set and then I used Rusty Hinge, Wild Honey and Aged Mahogany to colour the butterflies. As ever, I coloured the underside of the wings with Gathered Twigs DI, this just finishes the butterflies nicely and because you can see the underside of the wings, there are no "white" surprises when you look at it from a different aspect. The frame was coloured with Ruby, Copper and Spanish Topaz Treasure Golds, layering the colours on and building up the finish. I also added a little brass butterfly to the centre of the big guy for a bit of extra decoration. Hi stampers! It's Liesbeth here! If you've seen my work before, you'll know I'm not a big fan of adding lots of big embellishments and flowers, so these photo stamps (DDPS028 Castle and DDPS024 Canal) are really perfect to me. They are so beautiful and complete and in my opinion they don't need any addition at all! I primarily love the Castle stamp, it's Neuschwanstein Castle near Füssen in the south of Germany, my husband and I spent our summer holidays there this year! Sweet memories! This two cards above are done with the Crayon Resist Technique : Rachel shows that wonderful technique HERE ! I stamped the photo stamps onto white paper with black StazOn ink, scribbled some areas with white crayon, and I sponged the card with Distress inks.